Indian Equity Markets had a turbulent start to the new year as the benchmark NIFTY50 remained range bound throughout the day but saw a sharp decline in the last your of the trade. The Index ended the day losing 95.15 points or 0.90%. Though there is no technical breakdown on the Charts, the Monday’s session remain technically important and it has certainly pushed the NIFTY into some more time under consolidation. On Tuesday, we see a quiet opening to the Markets. We may see some lower volumes as well as the participation in the Markets will remain affected due New Year holidays. The levels of 10465 and 10510 will play out as important resistance levels to watch out for on Tuesday. Supports come in lower at 10380 and 10345. The Relative Strength Index – RSI on the Daily Chart is 55.2808 and it remains neutral showing no divergence against the price. The Daily MACD continues to stay bullish remaining in continuing buy mode. An engulfing bearish candle has emerged. It remains significant as it has occurred at the resistance zone of 10490-10535 and therefore it reinforces the credibility of this resistance area. 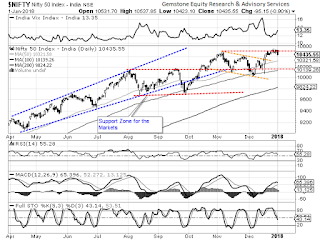 The pattern analysis reveals the importance of the 10490-10535 support zones. The Markets have once again failed to confirm the attempted breakout twice from these levels. This zone will continue to act as immediate short term resistance for the Markets. Failing to clear the 10490-10535 zones for the second time has shown the credibility of this resistance area. 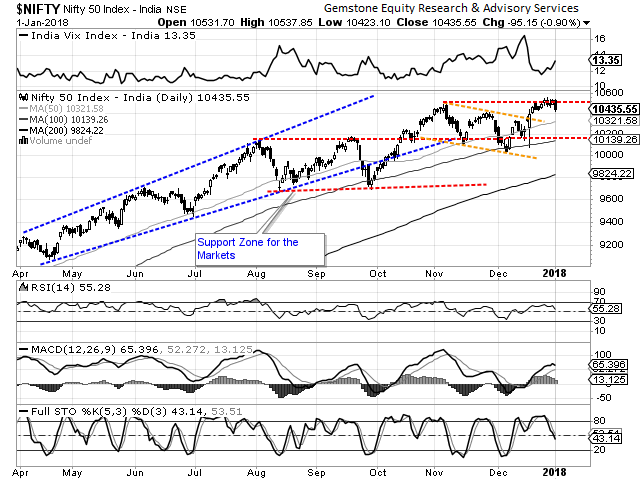 Failure to clear the 10490-10535 zones has made some more consolidation imminent in the Markets. There is no structural breach on the Charts but these levels will continue to resist until we see a comprehensive breakout above this resistance area. Going into trade on Tuesday, selection of stocks will hold the key. We recommend avoiding shorts and trimming exposures with any potential up move and protecting profits. Due to New Year holiday season, the volumes will remain affected and this may also infuse some lack of depth and volatility in the Markets. Cautious outlook is advised for the day.